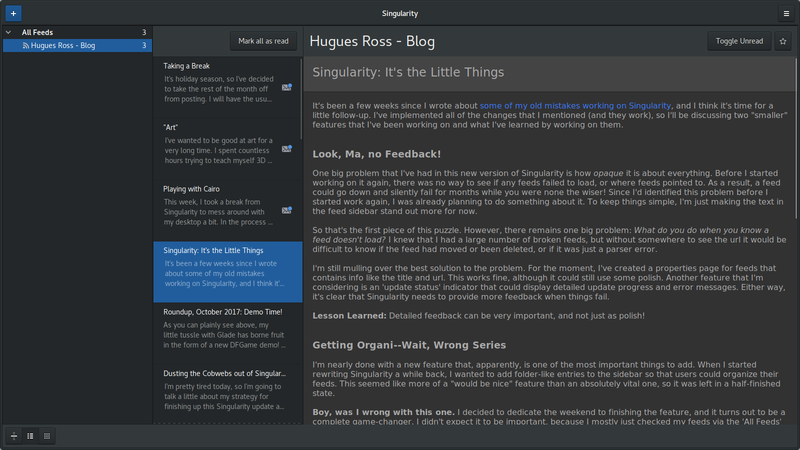 4 Hugues Ross - Blog: Singularity v0.3 relesed! Can you believe that it's been 3 years since the last Singularity update? That's crazy! Never fret, I have a new one right here. It ended up landing a week late, but I don't really mind. Honestly, I don't have much to say about the release itself that I haven't mentioned in a previous blog post. It's funny to see how far I've come since the first release, though. In the original version, you had to wait 10-15 minutes before it would actually open the window. In 0.2, the window would open but you pretty much couldn't do anything until it finished loading anyway. Now, it opens instantly and you can just start reading. Y'know, like any normal application. I think that's the really funny thing about the progress I've made over the years. I've finally gotten to the point where I can make something "acceptable", something that looks like a run-of-the-mill product. Up until now, my work had more of this... hacked-together student project quality to it. Now, it feels more professional. I think there are two main factors to this. One is obviously skill, you get better at things with practice. However, I think changing standards have made the more visible impact. For a long time, I developed things with only me in mind. I would embrace bugs and weirdness because the results were close enough to what I needed. Recently though, I've begun to think more in terms of "What would someone else think if they saw this?" As a result, I've been putting more effort into polishing my work. For a good example of this in action, look at the commits I made between merging my code and making this release. What happened is that I decided to take some screenshots of the program, but realized that there were tons of little inconsistencies and problems that would ruin the shot. This led me to start tweaking and fixing, until everything felt like it met a certain level of quality. In doing so, I realized that several of my earlier additions had been left half-finished, like bits of the column view UI and the popover for new subscriptions. I fixed them up, but I'll have to be more careful about this in the future. So that's a Singularity update out of the way. I'm still working on my game, slowly but surely. I was planning to release it this weekend, but it's still pretty rough. Since I no longer have a schedule to keep to, I'm in no real hurry to push this game out the door. I'd rather have one good, polished game that took too long than several bad games that I rushed.